The Ria Park Hotel & Spa is known for its elegance, charm and luxury. Located between Vale do Lobo and Quinta do Lago in the Algarve it provides an ideal location for holidays and golf. Set in a verdant valley the hotel rooms have beautiful views from their balconies or terraces over the gardens, pool area, or towards the long sandy beach and the blue of the Atlantic Ocean. 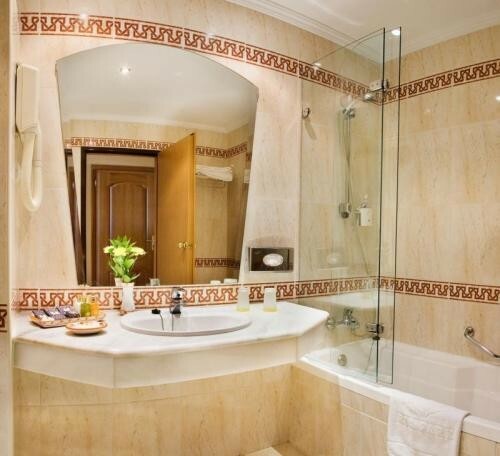 There are a total of comfortable 175 rooms and suites, all air-conditioned, quality furnishings, a safe, a mini-bar, radio and satellite TV, and Internet connection. There are 100 rooms reserved for non-smokers and 6 rooms equipped for disabled guests. The hotel has 2 outdoor pools, one of which reserved for children, and one heated indoor pool. The Spa Health Club is well equipped with treatment rooms for anti-stress and weight-lose programmes, massage, sauna, steam bath, Fitness Room and a Jacuzzi. There is a full size football pitch and two tennis courts, whilst surrounding the hotel are six of the most famous golf courses in the Algarve. 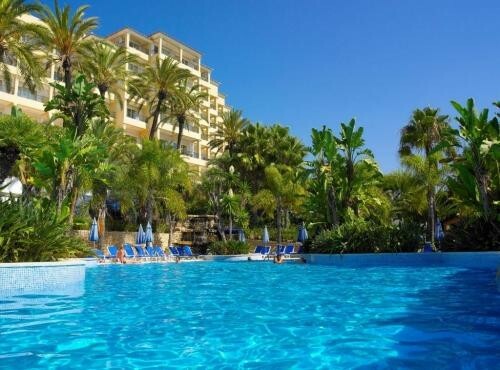 As the hotel is some 700 metres from a lovely beach there is a courtesy bus to take guests to their facilities which is a private area with towels, chairs and beach umbrellas. The hotel has two restaurants with non-smoking areas, one indoor bar with piano music, and one outdoor bar which also serves the pool area. The services available are child-minding upon request, a children's club with a special area, a business centre, meeting rooms and car parking. Features views of the tropical gardens and the pine groves of Ria Formosa National Park. Features views of the Atlantic Ocean. 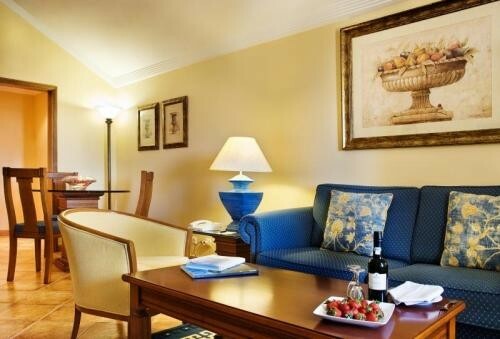 Spacious suite with 2 terraces overlooking the Atlantic Ocean or hotel gardens. Please note that the rate is based on 2 guests. Maximum occupancy is 3 guests (2 Adults and one child up to 12 years old in one extra bed. See Hotel Policies).